Of all the things corporations want, young consumers talking about their brands in a positive light — whether in person or online — is certainly up there. 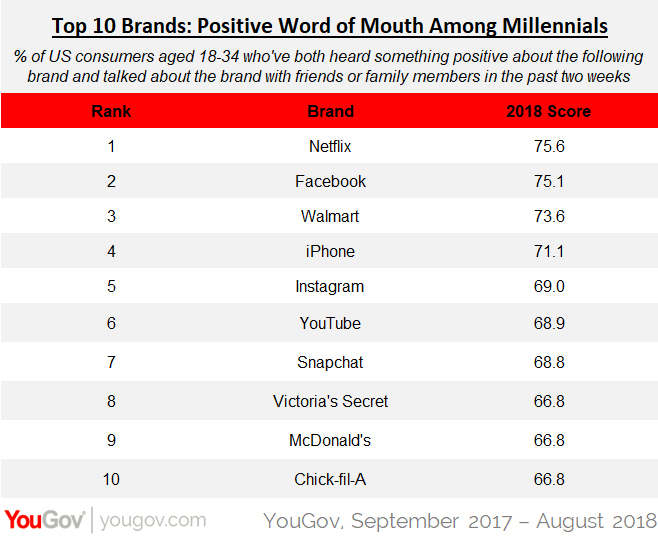 According to data from YouGov Plan & Track between September 2017 and August 2018, Netflix currently holds the top spot on a list of brands generating the highest positive Word of Mouth scores among US adults aged 18-34. Throughout the past year, 75.6% of Millennials recalled both hearing something good about the streaming service in the past two weeks and discussing the brand with friends or family members within the same time period. With over 130 million subscribers across the globe, a commitment to spend up to $8 billion on content this calendar year, and 23 wins at the recent Emmy Awards, it seems there’s plenty of upbeat stuff to say about Netflix. Second place belongs to Facebook, with three in four (75.1%) US consumers aged 18-34 having both heard something positive about the social network and discussed the brand with friends or family members. Facebook-owned Instagram (69.0%), which now has 1 billion users, came in fifth place, with a slightly higher percentage than YouTube (68.9%) and rival Snapchat (68.8%). Apple’s iPhone (71.1%), which helped turn Apple Inc. into the first publicly traded US company to reach $1 trillion in value, came in fourth place, behind retail giant Walmart (73.6%). Three brands — Victoria’s Secret, McDonald’s, and Chick-fil-A — virtually tied for eighth place, with 66.8% of the nation’s young adults reporting that they came across positive information pertaining to each one around the same time they discussed the particular brand. 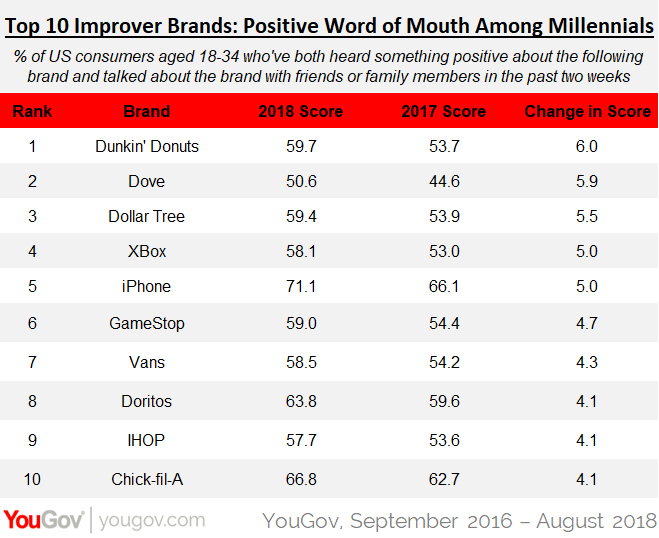 As for brands that saw the most improvement in positive Word of Mouth among Millennials, Dunkin’ Donuts had the biggest gains, climbing from 53.7% in 2017 to 59.7% in 2018. The franchise has begun experimenting with dropping the word “donuts” from its title, along with limiting product options and offering customers the ability to place their order via smartphone. Dove came in a close second place, inching up 5.9 percentage points compared to Dunkin’ Donuts’ 6.0-point increase. Microsoft's Xbox and GameStop also made appearances on the list, rising 5.0 and 4.7 percentage points, respectively. Vans likely got a lift from its recent Van Gogh-inspired collection of shoes and clothes, while evidence indicates IHOP benefited from its temporary name change to IHOb. YouGov Plan & Track first screened all of its 1,600 brands for positive Buzz, which asks respondents "Have you heard anything positive about the brand in the last two weeks, through advertising, news, or word of mouth?" Brands with low response volume were eliminated. From those brands, they were then ranked on Word of Mouth scores, which asks respondents "Which of the following brands have you talked about with friends and family in the past two weeks (whether in person, online, or through social media)?" All respondents for this research were adults 18 through 34 years old. Data was collected between September 1, 2016 and August 31, 2018.